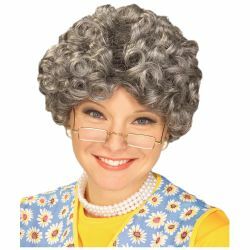 The curly grandma wig can be used as an alternative to the traditional bun wig for creating the look of an old lady. Character suggestions for this wig include grandmothers, Mrs. Claus, and Auntie Em from The Wizard of Oz. The curly grandma wig is colored as picture. The wig features an elastic band for a comfortable and secure fit to almost any head size. Don't forget a wig cap for a more secure fit and a wig stand to help organize your wigs and keep them neat, tidy, and expand the life of the wig.